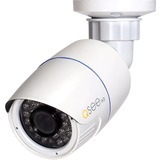 Q-See - QTN8059B - 4MP IP Bullet Security Camera - 100 ft Night Vision - H.265, H.264 - 2560 x 1440 - 3.60 mm - CMOS - Cable - Bullet - Ceiling Mount, Wall Mount"
Marketing Information: Q-See's 4MP HD IP Bullet Camera allow you to see the "Big Picture" of what's happening at your home or business establishment in the sharpest detail. Offering TWO TIMES the clarity of 1080p resolution, facial features, license plate numbers, clothing patterns, and other important identifiers are more clearly defined in 4MP IP HD, so whether you run a business or maintain a home, your 4MP Bullet Camera provides the ultimate in security protection! IP engineering enables this camera to work on its own from anywhere with a wired Power over Ethernet (PoE) connection, and you can check in on all the action at your home or business remotely from the Q-See mobile app from your smartphone, tablet, or computer.